At the Silk Route restaurant at the Holiday Inn Abu Dhabi, comfortable couches are strewn with colourful satin pillows, and the setting is bright and airy, with a relaxed, informal atmosphere. In the kitchen, head chef Abdul Salam Hamedi works to create nutritious and delicious recipes for Ramadan, utilizing the abundant seafood of the region. The Asian-Arabic theme of the restaurant is apparent in one of his creations, Fish Sayadiya. Wash the rice three times, then strain and set aside. Heat the oven to 180C. Mix the fish bones with the salt, pepper, half the cinnamon and cumin, the carrots and leeks. Tip onto a baking tray and place in the oven for ten minutes. Slice the onion and saute gently in olive oil until golden. Add the roasted fish bones to a large pan, cover with water and boil for 30 minutes. Strain the stock into a new pan and place over a medium heat. Add the rice, season with salt and black pepper and bring to the boil. Reduce the heat and cook for 20 minutes. Marinate the fish with the remaining spices and and roast for 12 minutes at 200C. 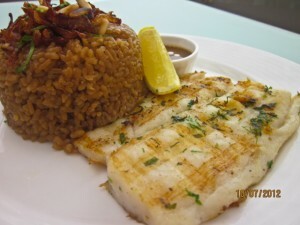 Serve the fish and rice with the fried onions and pine nuts scattered over the top. I know that Iran has some of the most complex and well-crafted dishes in the world, but I came across this simple one and thought it might be perfect for someone in a hurry, or a single student. This recipe originates in northern Iran. Even if you don’t normally cook with dill, give this one a chance. You’ll love it. 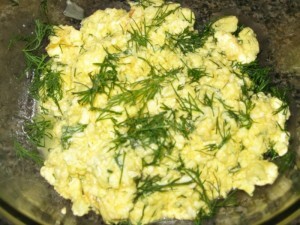 Fry your eggs sunny-side-up or scrambled. Sprinkle generously with dried dill, according to your taste. For a Western touch, serve with buttered toast or Italian bread.